Soltec Solar, the third largest photovoltaic solar tracker maker in the world, has secured a financing package worth €100 million to continue its global expansion on five continents. The company has recently increased its visibility in the United States with the opening of its Livermore, CA, testing site for bifacial solar panels. The €100 million syndicated credit facility involved 11 banks, was led by Banco Santander and included Bankia, Bankinter, BBVA, Caixabank, Cajamar CajaRural, Ibercaja, Liberbank, Sadabell, Banco Cooperativo Español and Banco Pichincha España. Banco Santander led the credit facility creation with advice from PWC. Soltec, specializing in single-axis trackers, has manufacturing facilities in Argentina, Brazil, China, and Spain, as well as offices in Australia, Chile, Denmark, Egypt, India, Israel, Italy, Mexico, Peru, and the United States. 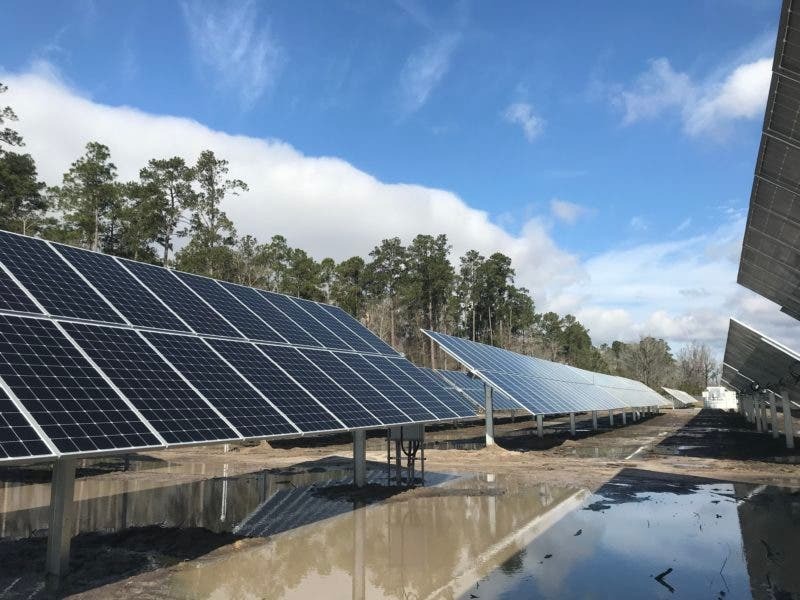 Soltec’s tracker installation at Estill, S.C, recently withstood Hurricane Florence. The 28 MW single-axis solar power plant suffered no damages for wind or water, the company says. Soltec’s new research and evaluation center in Livermore, The Bifacial Tracker Evaluation Center (BiTEC), will perform the assessment of installation and control parameter influences on bifacial tracker performance compared to other PV applications. Among bifacial panel manufacturers participating in the tests are Canadian Solar, Hanwha Q CELLS, Jinko, LONGi, and REC. Soltec and BiTEC are collaborating with the US Department of Energy’s National Renewable Energy Laboratory (NREL) to assist primarily in the application of simulation models. Soltec is also collaborating with independent engineer Black & Veatch and the Renewable Energy Test Center (RETC), to utilize the BiTEC resources in their joint Bifacial Characterization and Ranking Initiative to assess the performance gains and validate the performance models on bifacial modules from global module manufacturers. The standard Soltec two-up portrait module tracker configuration design eliminates the terminal problem of a one-up configuration and the torque tube imposing constant shading on the backside PV active-area, the company notes. “Soltec pioneered in bifacial tracking but now we are commercializing a mature standard product with innovation within cost-effectiveness criteria,” says Morales. Bifacial panels are the latest technological boost to the solar tracker industry, making use of both the front and the back of the solar panel to absorb light. Because the sun is in constant motion, bifacial panels work best on solar trackers, which mechanically follow the sun. Bifacial panels can yield 10-20% more energy than a mono-facial panel based on current practices in tracking. International standards for evaluating bifacial panels are due in January, after which time the best practices for aligning solar trackers for bifacial panels will become more standardized. The successful optimization of a few key variables, among the many involved with the technology, could result in much higher energy yields. While bifacial panels may cost slightly more than monofacial panels, the energy gain makes the use of the technology a clear economic winner. Manufacturer testing of the panels in the lab indicate that the energy gain could be many times higher than the current field results. Earlier this year, Soltec supplied complete tracker equipment to two solar PV power plants in Israel, to the Bnei Shimon regional council and to the Merhavim regional council. The project will have a total generating capacity of 17 MW, of which 2 MW will have bifacial panels. El-Mor Renewable Energies is the EPC contractor for the plants. El-Mor procured 534 of Soltec’s SF7 single-axis tracker and 64 of the SF7 Bifacial tracker. “In this project, regional challenges stem from being high-desert with extreme climate conditions; being remote from population centers and infrastructure; and having harsh supply logistics and installation circumstances that pose risks to the project timeline. Our equipment is utterly proven under desert conditions,” said Emilio Alfonso, Soltec’s VP of sales for the EMEA region. Soltec has supplied and installed more than 400 MW to PV plants in desert areas of Chile, Israel, Jordan, Morocco, Spain, and Turkey. In 2015, Soltec manufactured the first tracker specifically designed to mount bifacial panels at a power plant in La Silla observatory, Chile. “This (La Silla) plant is unique, not only because of powering an astronomical observatory. It was the first utility plant with bifacial modules,” said Morales, at the time of the announcement.